One of the most famous places in the capital of Italy is Trevi. This is the biggest and luxurious fountain in Rome. Together with the adjoining Poli Palace, Trevi Fountain is a single magnificent architectural ensemble. The sculpture of the fountain rises up to 26 m, its length is 20 m. The statue of the god Neptune symbolizes the life-giving water, which has brought coolness to inhabitants of the Rome for many centuries. 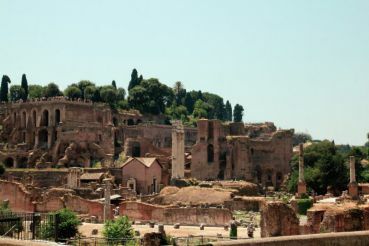 In the 19 century BC, during the reign of Emperor Octavian Augustus, Marcus Agrippa Vipsanius decided to provide clean drinking water to Rome and sent Legionnaires to find the source. The source was found. The system of aqueducts stretching up to 13 km was built. Clean drinking water has been supplied to the Eternal City already for 2 millenniums through these aqueducts. In the 15 century, on that place where today Trevi Fountain is located, there was a chalice which supplied water from the aqueduct. 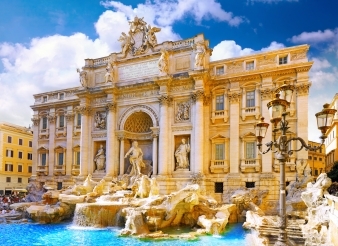 Nicola Salvi, a representative of the Baroque school, began to build Trevi Fountain in 1732. The building lasted about 30 years, and in 1762 Pope Clement XIII opened the complex of the Trevi Fountain and Poli Palace, which even today enthrall tourists from around the world. Trevi Fountain is visited daily by thousands of visitors who not only admire this work of art, but also observe a ritual. Turning back to the fountain, tourists throw a coin over a shoulder to the feet of the gods and goddesses, asking them for favors. 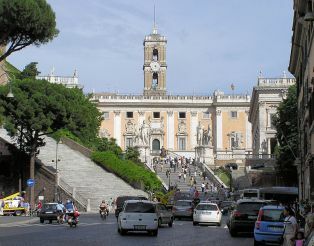 Besides, there is a legend that who throw a coin into the fountain, they will certainly return to Rome. Two coins promise a romantic meeting, three – marriage, and four – the wealth. To the right of the main group of sculptures, you can see two tubes of which water flows. If lovers at the same time drink the water from the two "tubes of lovers", they will live happily ever after and never brake up. But the legend, which says that if you swim in the Trevi Fountain, you can gain eternal youth and health, is not recommended to check. Near the fountain police is constantly on duty, and swimming in the fountain can cost you 500 euro fine. Coins from the fountain, which utility services collect during cleaning the fountain, go for restoration work and charity. Their sum is up to 700 000 euro per year. The nowadays view of the Trevi Fountain was commissioned by Pope Clement XII. It was made by the sculptor Nicola Salvi. Trevi Fountain together with Palazzo Poli form a unique complex. The facade of the fountain is made in the form of a huge semicircular niche with four columns on either side. The top rail is decorated with four statues representing the seasons. The composition is dedicated to ancient mythology and the god Neptune. From the central niche goes Neptune on a chariot-shell driven by two sea horses, one is calm and the other is dashing – both symbolize the status of marine waters. Tritons, blowing in sea shells, manage sea horses. In the niches located on either side of Neptune, one can see figures of the goddesses of Fertility and Health. Jets of water poured on the majestic sculptures fall on the rocks, creating the effect of a sea. 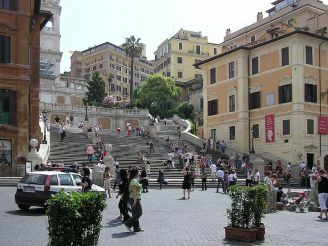 To get to the fountain from Piazza Venezia, you have to go through Via del Corso, then turn, following the signs to a small alleyway – it is difficult to get lost, because a large number of people goes in the direction of the Trevi Fountain. It is better to look at the fountain in the evening and at night when the lights turn on.